Here is a HUUGE thank u from the ol Fubar to Dusty My 63 International was running real bad,firing on somewhere between 8or6 cylinders, mileage from a high of 8 to a low 0f 3gallons/mile till it finally didn't run at all(GUZZI content)! Compression was 20/30 pounds above normal,smell of gas or equivalent was present in oil. The engine would turn over seriously fast,it would not even fire on one cylinder--new plugs + wires-condenser ,coil ok. Out of desperation I called Dusty,he said,Oh I DON'T KNOW--- ol Indian trick was to pour cheap whiskey over engine ,try it Well, after saturating the area with cheap whisky I realized I had a real problem, I bought the 1.75 size using only 1/3 of plastic (I said cheap)bottle! That wasn't the problem,the problem is I will have to drink the rest of the whisky my self (you can't let it set around---something about the environment)!! !Yikes, I will have to do this myself cause I don't get much company or friends stopping by to drink my lousy booze Wouldn't you think DUSTY would have told me to only use the good stuff!!! Pick up? Those were beautiful looking, far better than those made today. Where did ya go fubes ? It is a dump truck , and no , not a carburetor problem . If you didn't cut your teeth on pre '65 engines running straight weight oil the chances of figuring out what was wrong are really slim . Remember the two main indicators of what was wrong were really high compression readings , and gasoline in the oil . Heck , it is doubtful that most mechanics who started working after maybe 1974 could diagnose the problem W/O some serious surgery . Just going to say that. A story about early Mitsubishi engines that had that problem. A garage on the West Coast (NZ) was working on one that had the problem. Started it up and the gas in the sump ignited, blew the cam cover clean off and left a dent in the roof! It was reputed to look spectacular when she blew. You guys are missing the clues , stupid high compression , losing cylinders , single weight oil (low or no detergent) in its early life . 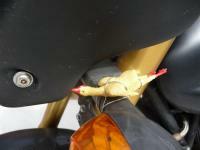 Pushrod off the perch? Valves not opening? Wasn't that flight booked on a 737-Max-8? We got em stacked up like chord wood in Tulsa right now.